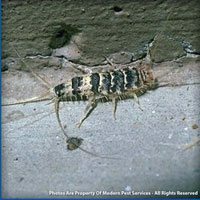 Silverfish thrive in a moist environment which is why they are usually found lurking in kitchens and bathrooms inside your home. They can also be found hiding out under boxes, in closets, attics or in drywall or insulation. Silverfish feed on starches and proteins, fabrics, paper and the glue used in book bindings. Silverfish are prolific pests laying 100 eggs at a time with a short 43 day gestation. 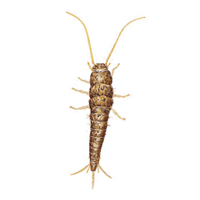 If you have spotted Silverfish in your home, call a Modern Pest Control professional today.